On the 26 January 2018, various celebrations were held in Thailand to celebrate Australia Day. Of particular note, Australia’s Ambassador to the Kingdom of Thailand, H.E. Mr Paul Robilliard and Consular-General, Craig Ferguson both hosted receptions to celebrate Australia Day. 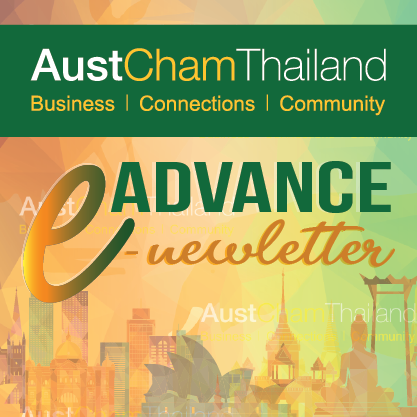 While, the Honorary Consul of Australia in Chiang Mai, Ronald J Elliott visited local Australian businesses to mark the occasion. These celebrations not only celebrated Australia Day but also the close relationship that Australia and the Kingdom of Thailand continue to enjoy. H.E. Mr. Paul Robilliard (fourth from left)and his wife Mrs Hanan Robilliard (fourth from right) hosted a reception to celebrate Australia Day at the Grand Hyatt Erawan Hotel, Bangkok on 26 January 2018. Among distinguished guests were (from left to right) CEO (Philippines and Thailand) of ANZ Bank, Ms Panadda Manoleehakul; Chairman and CEO of Supalai PCL, Dr Prateep Tangmatitham; Chairman of the Election Commission, Mr Supachai Somcharoen; Former Deputy Minister and Former Minister of Education, Mr Phongthep Thepkanjana; Chairman of Board of Trade of Thailand, Mr Kalin Sarasin; and Secretary-General of Narcotics Control Board, Mr Sirinya Sitdhichai. Down in Phuket, Australia Day was marked by a reception hosted by Consul-General Craig Ferguson at the Hilton Hotel Karon Beach. Guests came together from Thai government, military, academia, community groups and many other friends of Australia. During a speech the Governor of Phuket Mr Norraphad Plodthong reflected on the strong relationship that the Phuket government enjoys with the Australian Consulate-General. Also in attendance were Vice Governors from neighbouring Krabi and Phang-nga provinces. Guests were transported to Australia using Virtual Reality goggles from Australia.com and treated to footage of the spectacular Khon Dance troupe performing at the Sydney Opera House last August to mark 65 years of Australia-Thailand diplomatic relations. During the evening New Colombo Plan students Stacey Cavill and Marley Mickle from Murdoch Uni in Perth, spoke about their experience so far in Phuket and how the program had helped shape their views of the region. To take home, guests were given Australian lamingtons provided by local Australian-owned business Lady Pie. Our Honorary Consul of Australia in Chiang Mai, Ronald J Elliott, Honorary Consul of Australia in Chiang Mai, visited a couple of local Australian businesses today as we mark Australia Day – a chance for the Australian community in Northern Thailand to come together, socialise and celebrate. Previous AustCham Member Calendar: Don’t know where to celebrate Australia Day?